Aerobic style exercising is one of the most effective ways to build up your stamina and burn calories. For example, a great and effective aerobic exercise is running up a flight of stairs. This exercise really works your heart and lungs as well as building strength into your thighs, calf muscles and buttocks. It also works the upper body as well. Aerobic exercises strengthen your cardiovascular system. This important system involves the functions of the heart, lungs and blood circulatory system. As you exercise your heart rate increases pumping more blood through the body. This also helps you to lose weight by burning more calories. The sports exercise market are very aware of the benefits of aerobic and cardiovascular style exercises and have produced a range of machines such as the treadmill and elliptical to help people get fit. They were also aware of benefits of running up steps and stairs and therefore, produced the mini stepper . 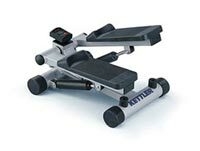 The mini stepper — or mini stair stepper as it is also known — was designed to simulate the movements of running or walking up a flight of stairs. The original stepper which was the forerunner of the mini stepper looked very similar in design and size to the treadmill and elliptical machine. These machines were also very popular with keep fit fanatics and it would be a rare sight not to see one of these machines in a gym or health club. Due to its popularity sports equipment manufacturers produced a smaller more compact stepper in order for it to be accessible to a larger market. From this was the born the mini stepper that we have today. The design is basically very simple. It consists of two foot pads or pedals that you push down on. When you apply pressure the hydraulic system underneath creates a resistance which builds strength into your legs. Certain models come with handle bars to help you keep balance or resistance chords that also enable you to work out your upper body simultaneously. Always seek a doctor’s advice if you have a medical condition before doing any form of new exercise. Hallelujah! I didn’t know about mini stair steppers, but I will check them out.